Summer looms again (in the Philippines at least) so it’s natural to crave for cold stuff to help us ward off the sweltering heat. In fact, it’s quite normal to see me scampering off to the Chowking next door to grab a serving of Mango Tapioca (my most recent addiction) or across the street to grab some Twin Popsies. Despite the accessibility of these two frozen desserts though, there’s another frozen dessert that holds a special place in my heart. It’s called Yukimi Daifuku. Remember how good I thought Magnolia’s Mochi Ice Cream was? Well, take that and multiply it a couple of times over and you get the grandma of mochi-coated ice cream. 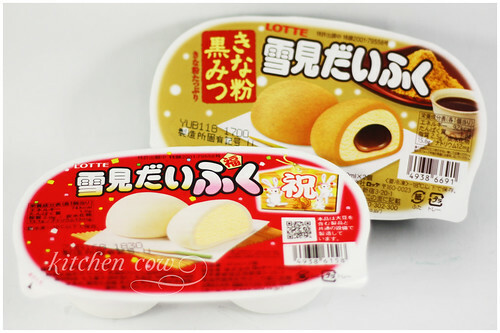 Lotte’s Yukimi Daifuku is actually the first of its kind! Initially, Lotte was experimenting on a marshmallow coated bite-sized ice cream snack. But because mochi, a pounded rice cake made from glutinous rice, was more popular, it quickly replaced marshmallow to become the first mochi-covered ice cream snack. And what a glorious switch it was. Yukimi Daifuku is a delicious play on texture. 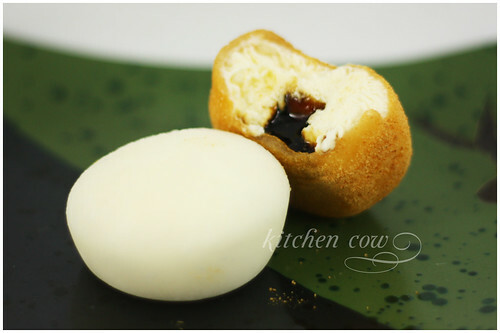 It marries the pliable, soft mochi and the creamy, cold ice cream for a yummy, refreshing snack. With its white color that’s made even purer by a powdery white coating, it looks like a small snowball. I guess it’s appropriate to call it Yukimi Daifuku which translates to snow-viewing daifuku, snow-viewing being a traditional winter activity that involves, well, what else but watching the snow fall? On the other hand, daifuku, traditionally, is a sweet, mochi cake that’s most commonly filled with anko or red bean paste. In this case though, it’s filled with ice cream for a most delightful twist on the traditional. Aside from the vanilla ice cream-filled daifuku, I was also lucky to grab a pack of this winter’s special edition Kinako Yukimi Daifuku. Dusted with kinako, a toasted soybean flour, it reminded me a bit of Laguna’s Espasol, a traditional Filipino sticky rice snack. Aside from the kinako coating, it also had a brown sugar syrup inside. Soooo good! The syrup’s sweetness was just right, complementing the ice cream nicely without overpowering it. I like the Kinako variety even more than the plain one but I guess I’ll have to wait until next winter, if they decide to re-release it. Judging from the commercials I saw on Youtube, there are even more regular and seasonal variants so you bet I’ll be waiting like crazy for the Japanese summer, crossing my fingers for a bite of that yummy looking Ichigo Yukimi Daifuku (strawberry). And that insanely evil looking Nama Choco variant! I highly recommend hitting your nearest Japanese grocery’s ice cream chest for a couple of packs of these. But please, whatever you do, don’t buy them all out. Leave some for me! This entry was posted in food spotlight and tagged anko, daifuku, frozen dessert, frozen desserts, glutinous rice, ice cream, japanese candy, japanese ice cream, japanese snacks, lotte, mochi, mochi ice cream, soybean flour, sticky rice, vanilla ice cream, watching the snow, yukimi daifuku. Bookmark the permalink. I also just discovered the mango tapioca dessert of Chowking. Sarap! I really need to go to Makati and buy some of that daifuku! I just tried this last saturday. sooo yummy, yum yum. there’s this japanese ice cream dessert thing i’ve been looking for for ages, i wonder if you’ve seen it? its a waffle sandwich with thin chocolate slabs and ice cream sandwiched inside. my dad’s friend used to give it to us a bout 2 years go but she never told us where she got it, she refused to for some reason. and she left for indonesia shortly after and hasn’t come back since. I got to taste Morinaga’s Choco Monaka Jumbo after stuffing myself silly with salmon sashimi for lunch. It was a choice between the Yukimi Daifuku but I think the chocolate slab in the middle won me over. It was good, albeit a bit expensive at 3.10SGD. it looks like waffles but its more crispy and what we called “monaka-wafers”. kinda traditional wafers for japanese wagashi stuffs and its made of flour and rice powder. this is also one of japan’s long seller ice cream dessarts. wah, now i want some and i don’t know where to buy it here. Thailand is very hot too!! I’m dying of this hot summer day in Bangkok!!! Where is the air-condition, I do need it!!! Oooh that sounds so good. I want to look for some. I'll give you a heads-up if I find some. Absolutely! I hope you get to try it soon. It's nyummers! OMG! I want to try these!!! Would you know where I can buy these? I live in BF Pque. It’s funny considering I live in the South as well, but I’m not familiar with the Japanese groceries in our general area. I usually buy from Choto Stop e. I’ll let you know if I ever find some near us. Where do you buy all your japanese treats?